CalGeo offers a number of ways to get involved and gain valuable leadership experience. We’re always looking for enthusiastic professionals who share CalGeo’s commitment to the industry and want to lend support in big ways and small. CalGeo is structured into 12 committees that address various issues and conduct the organization’s business. Find one that meets your interests and get involved today! Business Factors: Join the team that compiles CalGeo’s annual salary survey – our most popular report. Communications: Become the megaphone for our organization; help spread the word about CalGeo and its efforts through newsletters, emails, the Web site and more. Government Practices/Legislation: Monitor and take positions on legislation and direct CalGeo’s advocacy efforts in Sacramento, Washington, D.C. and at the local level. Membership Relations: Publicize the benefits of membership and help grow the organization through outreach and special promotions. Outstanding Project Awards: Help coordinate CalGeo’s biggest event of the year, where members are recognized for their exemplary work. Professional Affiliations Committee: Strengthen CalGeo’s position in the industry by cultivating relationships with other professional organizations. Programs - Conference: Get active on the local level and be part of a team that plans CalGeo’s various regional and statewide events. Emerging Professionals: CalGeo Emerging Geoprofessionals is a group of geotechnical, engineering geology and geology professionals, and students that want to acquire both technical and business related training and professional development. Student Outreach: A shortage of geotechnical engineers exists in our industry. 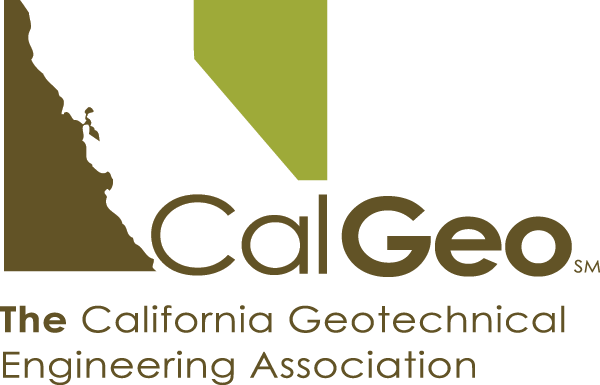 This committee works to foster our industry’s future leaders by participating in CalGeo’s programs and events geared towards college students pursuing careers as consultants in geotechnical engineering. Technical Advisory: Lead the charge as we keep members informed of new trends, tools and techniques – and cement CalGeo as the go-to organization for all applied aspects of consulting geotechnical engineering in California. Technician Affairs/Safety: Help keep our members safe and limit their exposure to litigation by working with this committee to host CalGeo’s annual loss-prevention seminars. Means & Methods: This committee is chaired by our immediate past president and provides oversight for the Board of Directors and the executive director to assure the highest standards and ethics in our association.